Mini scrapbooks are essentially smaller versions of traditional 12" x 12" scrapbook albums, with most measuring six inches square. You can also find mini albums in various shapes and sizes. Whether you're new to scrapbooking and feel more comfortable trying to fill a smaller page, or you're looking for a way to expand your larger projects, scrapbooking on a smaller scale can be just as satisfying as working on a larger album. 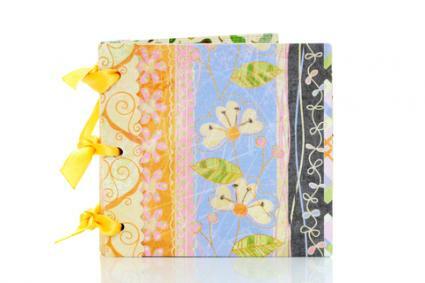 You can easily purchase mini scrapbooks from Hobby Lobby, Michael's Crafts, or any scrapbooking supply specialty shop. The following websites also offer albums as well as full kits. Take some time to explore what's available and see if you find some inspiration. Photographs and Memories offers quite a few mini albums and kits that will help you create pages in a snap. They have many themes and styles to choose from. American Crafts Modern Album - This album comes with ten 6" x 6" page protectors. The pages are held in place with interlocking D-rings. Scallop Accordian Book - This square shaped accordian album with scalloped edges, offers a great way to include additional photos in a 12" x 12" layout. Winter Memories - This gorgeous blue and white album measures about 4 1/2" x 5", and it includes Echo Park papers, chipboard pages, and a variety of other embellishments to help bring your photos to life. Selfie Album - The pages in this album are a variety of sizes (the largest is 9" x 9") and provides the ultimate way to capture your best selfies. The album has five pages, and features two waterfall pages and two pocket pages. Document Your Journey - Preserve your memories of your trip with this 6" x 6" album. This creative journal-turned-scrapbook features an envelope system to keep all those momentos, as well as a variety of embellishments for the ultimate souvenir and keepsake. You'll find a number of mini albums and kits at Scrapbook.com, plus savings on discontinued items. Superheros - This 6" x 6" album comes with all the pages and materials necessary to construct your best mini album yet. It's a great option for documenting a superhero birthday party, or anyother hero-worthy project or event. Simple Stories Say Cheese III - This is the album you need to create a keepsake of your Disney trip. It features both snap pages and pocket pages, as well as stickers, letters and other embellishments. Creating your own mini scrapbook isn't difficult. You just need to break the process down into a few basic steps. It's impossible to cover a very broad topic in a mini scrapbook album. You'll have more success if you stick to a well defined theme. A list, such as "Ten Things I Love About You" or "Top 5 Funny Family Moments"
A mini album works best if you keep your layouts limited to one or two photos and a small bit of journaling. If you don't feel like reprinting your photos at a smaller size, use the mini album as a chance to salvage prints that would otherwise be unusable. For example, if you have a flattering photo of your sister sitting next to your brother making a funny face, use one of your circle or square punches to crop out your sister's image. If you have a Christmas photo of your daughter that makes it look like she has a tree growing out of the top of her head, try to use creative cropping to make this photo suitable for your mini album. You won't have a lot of room for embellishments in your tiny scrapbook, so it's important to choose your accents carefully. Many frugal scrapbookers use the mini album as a chance to make the most of their leftover paper scraps and embellishments from larger projects. Choose flat embellishments whenever possible so they don't catch and pull away from the pages. Use photo corners or full frames to protect the edges of your photos. Use strong adhesives to attach all of your embellishments to your layouts. Working on a smaller layout doesn't automatically mean that your pages will have less character. You just really need to focus on the main idea you want the page to convey, and then choose your page elements carefully. With mini albums, the old adage that "less is more" has never been so true.